It wasn't a lovely day for a parade as a 40-degree chill settled on the city Saturday. 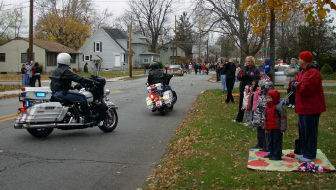 But seeing some groups of well-wishers along the Veterans Day parade route was sure to have warmed veterans' hearts. With several family members and friends who have served in the military, she feels the need to show her appreciation. 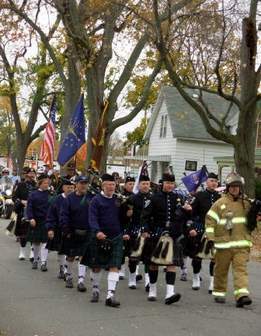 The annual parade marched north on Parnell Avenue from State Boulevard and ended at Memorial Coliseum, where a service honoring veterans and those currently serving in the armed services took place. 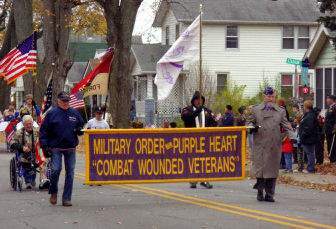 When Veterans Day comes Tuesday, veterans may feel honored, but some issues still will trouble their minds. A big one is the future of the Fort Wayne campus of VA Northern Indiana Healthcare Systems. On Oct. 27, a consultant's report on the need expected of the outpatient services at the local facility, 2121 Lake Ave., was due. It will be looked at by top Veterans Administration officials. A VA commission in 2004 recommended closing the center's 26-bed inpatient unit, only to say a year later that it had not taken into account the need for treatment by veterans returning from Iraq and Afghanistan. Results of a second study in 2006 on the inpatient unit have still not been released. As some parade groups handed out candy and U.S. flags, Mike Tucker, a Vietnam veteran, drove his wheelchair along the parade route to give out brochures that bring attention to health care. Tucker, along with then-Councilman Tom Hayhurst and several others, helped found Veterans for Better Health Care in July 2004 to lobby against the VA center's closure. The group meets at 7 p.m. the third Thursday of the month at American Legion Post No. 82 at Goshen and Harris roads. “They helped me get this,” Tucker said, tapping on his wheelchair before moving on to spread the word.